I stumbled across an original copy of this book in an antiquarian bookstore in Biloxi, Mississippi back in 1997. I took it home and devoured its contents in just a few days, and then handed it to my wife who also made short work of it. This has since proven to be one of the most consistently bestselling reprints that we have published and has been well worth the initial $100 investment. The author, who was actually Mrs. Elizabeth Avery Meriwether of Tennessee, does a masterful job of weaving eyewitness testimony, official government documents, and other items of historical interest into a gripping narrative of the war and its aftermath that is always informative, sometimes humorous, and never boring. The women of the South were noted for their almost religious devotion to the cause, and Mrs. Meriwether was certainly no exception. Indeed, her fiery animosity toward the Northern demogogues who were responsible for destroying the constitutional Union comes across on nearly every page. Chief among these demogogues, of course, was Abraham Lincoln, to whom the first third of this book is devoted. Although the writer of this has no authentic account of any secret caucus held by the Republican leaders in Washington City at the time of Mr. Lincoln's death, their entire unity of action in the unexpected emergency that confronted them is presumptive evidence that a caucus was held, almost before Mr. Lincoln's body was cold; that plans were made and secret instructions sent forth to the foremost men of the party, advising them of the course necessary to pursue, the tone, the attitude, it was the duty of every man to assume toward their dead President. The men composing the caucus saw as by a flash of lightning the vital necessity of concealing from the world the opinions they and their whole party had held of the living Lincoln. The preservation of party power was their first thought. They saw the black gulf into which their triumphant party would sink unless swift measures were taken. They realized the fact that if their President were known to the world as they knew him, the glory of their victory would fade; as he stood, so their party would stand. If he was despised, they and their party would be despised. If made public, every venomous word they had flung on the living Lincoln would rebound on their party. To exalt the dead President became the vital necessity of the hour [pages 3-4]. In 1835 Lincoln wrote a book on infidelity and intended to have it published. The book was an attack on the idea that Jesus was Christ. Lincoln read the book to his friend Hill.... Hill, believing that if the book was published, it would kill Lincoln forever as a politician, seized it and thrust it in the stove. It went up in smoke and ashes before Lincoln could get it out. When Mr. Lincoln was candidate for the Legislature he was accused of being an infidel, and of having said that Jesus was an illegitimate child. He never denied it, never flinched from his views on religion. In 1854 he made me erase the name of God from a speech I was about to make.... In the year 1847 Mr. Lincoln ran for Congress against the Rev. Peter Cartright. He was accused of being an infidel; he never denied it. He knew it could and would be proved on him. I know when he left Springfield for Washington he had undergone no change in his opinion on religion. He held many of the Christian ideas in abhorrence.... The idea that Mr. Lincoln carried a Bible in his bosom or in his boots to draw on his opponents is ridiculous [pages 54-55]. While it is clear that Mr. Lincoln was at all times an infidel, it is also very clear that he was not at all times equally willing that everybody should know it. He never offered to purge or recant; he was a wily politician and did not disdain to regulate his religious manifestations with reference to his political interest. He saw the immense and augmenting power of the churches, and in times past had felt it. The charge of infidelity had seriously injured him in several of his earlier campaigns. Aspiring to lead religious communities, he saw he must not appear as an enemy within their gates. He saw no reason for changing his convictions, but he saw many good and cogent reasons for not making them public [page 56]. Mrs. Meriwether notes that Lincoln had "a passion for indecent stories" [page 67], and even John G. Holland, who nearly worshipped Lincoln in his 1866 biography, was forced to admit that "men who knew Mr. Lincoln throughout all his professional and political life have said that 'he was the foulest in his jests and stories of any man in the country'" [page 68]. Herndon remembered that "Lincoln could never realize the impropriety of telling vulgar yarns in the presence of a minister of the gospel" [page 68]. According to biographer General Donn Piatt, Lincoln's stories were of such an indecent nature that "not one of [them] could appear in print" [page 69]. Another popular myth concerning Lincoln which Mrs. Meriwether tackles is that his main incentive in running for public office was to use it for the benefit of the downtrodden and unfortunate segment of humanity, particularly the Black man. The portrait of the tender-hearted Abolitionist, nearly single-handedly striking the chains from the hands and feet of the slaves of the South, is so engrained in the American psyche that there is little hope of Lincoln ever being seen as anything other than the patron saint of civil rights. However, according to Ward Lamon, "Mr. Lincoln was never agitated by any passion more intense than his wonderful thirst for distinction.... Thirst for distinction governed all his conduct up to the day the assassin ended his life" [page 80]. Lincoln came out publicly against slavery only when he perceived political advantage could be achieved from taking such a stance on the subject, but, according to General Piatt, "Mr. Lincoln could no more feel sympathy for the wretched slaves than he could for the horse he worked or the hog he killed" [page 81]. He openly denied any designs to "introduce political or social equality between the white and black race" and declared that "there is a physical difference between the two which probably will forever forbid their living together on the same footing of equality" [page 218]. Even when he was forced by political pressure to issue his celebrated Emancipation Proclamation, he was still careful to avoid taking a strong anti-slavery position: "My paramount object is to save the Union, and not either destroy or save slavery. If I could save the Union without freeing the slaves, I would do it. If I could save the Union by freeing some and leaving others in slavery, I would do it.... What I do about slavery and the colored race, I do because I believe it helps to save the Union" [page 218]. In 1854 the dismembered Federals of New England and the disorganized Whigs united and formed the Republican party. These old disunionists under their new name took up the fight on the three objects of New England's hate — Democracy, the Union and the South — exactly where the Federals had ceased their open fight in 1815. So far from New England's sentiments having softened since that time, her three hates, under the lead of Republicans, assumed the force and fury of insanity, as may be seen in reports of speeches, sermons and lectures [pages 122, 123, 132]. These anti-democratic, anti-South, centralizing tendencies of the North repeatedly surfaced throughout the years leading up to the outbreak of war in 1861, and were, as noted above, the platform on which the Republican party itself was founded. According to New England Abolitionist Wendell Phillips, "The Republican party is in no sense a national party. It is a party of the North, organized against the South" [page 94]. William Lloyd Garrison, another noted Abolitionist, declared, "I have said... that in proportion to the growth of disunion will be the growth of the Republican cause. This Union is a lie!" [page 138] At a Republican meeting in Faneuil Hall in Boston in February of 1854, it was resolved, "That we seek the dissolution of this Union, and that we hereby declare ourselves the friends of a new Confederacy of States, and for a dissolution of the Union" [page 144]. Hamilton's monarchic principles certainly made Lincoln's work possible. Lincoln put in practice what Hamilton had advocated. Hamilton made no concealment of his monarchic principles; he preferred a monarchy such as England has, but failing that he wanted a President for life and the Governors of States appointed by the President. Until seated in the White House, Lincoln talked Democracy and affected great esteem for Jefferson's Democratic principles. As soon as he held in his grip the machinery of government, he schemed for absolute power, and as soon as he was commander in chief of nearly 3,000,000 armed men, no imperial despot in pagan time ever wielded more autocratic power than did Abraham Lincoln, and Republican writers of today are so imbued with imperialism they laud and glorify Lincoln for his usurpation of power [page 136]. 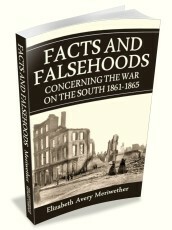 Subsequent chapters deal with subjects such as the falsehood that the North fought the war in order to bring an end to the institution of slavery, the attempts made by the Northern authorities to instigate a slave uprising throughout the South, the alleged maltreatment of Northern prisoners of war at Andersonville prison, the barbarous war against civilians perpetuated by General William T. Sherman's troops as they burned their way through Georgia and the two Carolinas, the horrors endured by Southerners during the Reconstruction period, and much more. Mrs. Meriwether cautions that "despotism is a noxious plant, which hates the light and flourishes only in dark places." Indeed, a people who are kept in ignorance of their past will offer no serious resistance to tyranny in the present and future. This book is therefore a must-read for everyone who is not afraid to re-examine popular myths and who really wants to understand how the War of 1861-1865 continues to affect us to this day.